The above mentioned letter mentioned is reproduced below. I had always been able to breath through the right nostril. I never had complained about the right nostril. I complained that my nose tip was soft, that there was missing cartilage. I made this appointment because the swelling associated with the infection quickly returned since the last 10-day course of antibiotics. Here, again his report falsely contradicts this. See the date of my antibiotic prescriptions. I also had to ask about the cartilage that seemed missing from the end of my now soft and fleshy nose. When the doctor sat in a chair against the wall 8 feet opposite me and stared directly at me, I had an impulse and followed it: I "wagged" my nose (like a dog wags his tail) left and right once to demonstrate my complaint about the missing cartilage. The doctor told me not to move it, or it would not heal. I thought I should say it "wags" when I chew or make facial expressions, but I didn't want to hear his solution to that! The doctor drew a diagram on a scratch pad to show where he removed cartilage. The end or tip of my nose was not shown in the sketch. 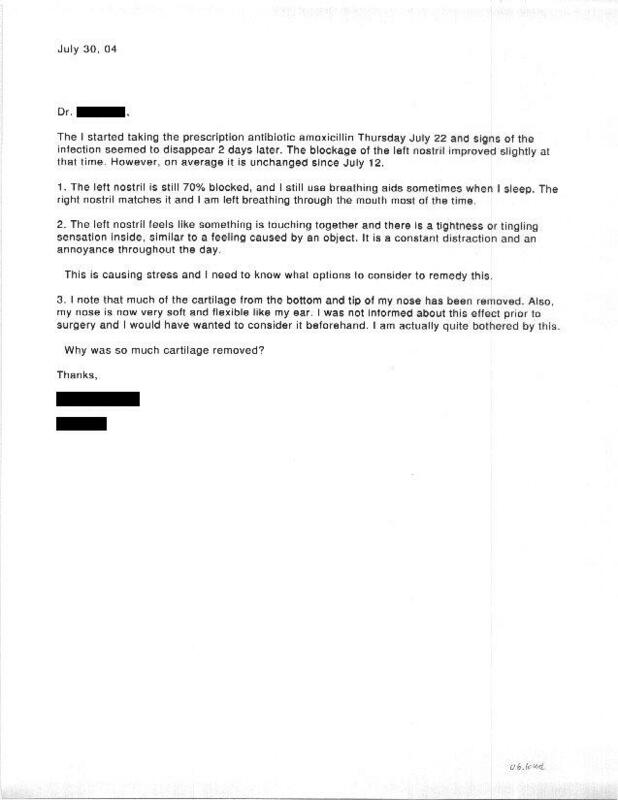 The doctor LIED about removing minimal cartilage. I complained that I wasn't able to breath through my nose, that there was really not any improvement since before the operation. In response, the doctor then told me that I had "collapsing cartilage", and that an operation to remedy it would give my nose "a pig snout appearance", and he mentioned the name of some professional basketball player as an example. 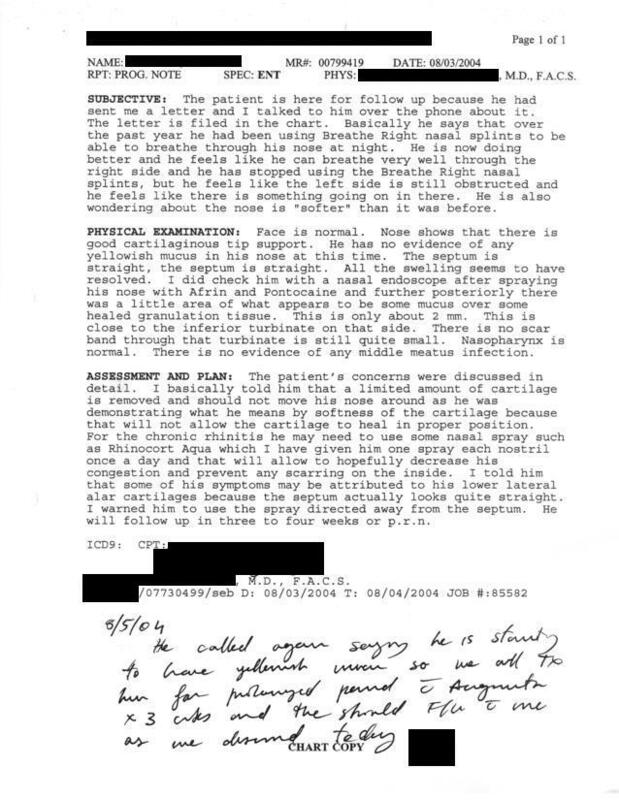 I was never before told that I had "collapsing cartilage". I wondered why he didn't discover the "collapsing cartilage" during the pre-surgery examination. I later discovered that the lack of cartilage caused by his removing it causes my nose to collapse, not his theory about "alar" cartilages. The doctor gave me another prescription for amoxicillin ($5 / pill), and instructed me to call when they where used and he would call the pharmacy to renew it once.